On Dec. 6, 1989, 14 women were shot and killed at the engineering school by a gunman professing to hate feminists. 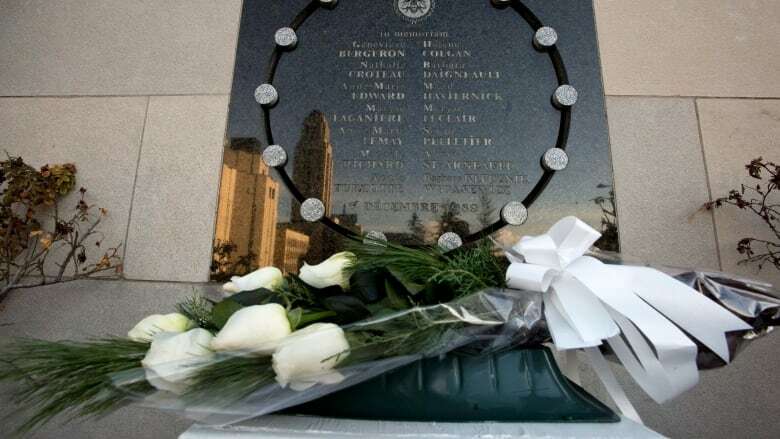 Polytechnique Montréal held a simple ceremony Tuesday to mark the 27th anniversary of Canada's worst mass shooting. The school says it wanted its commemoration to have a more personal touch this year. In a ceremony this morning, staff members placed 14 white roses at the memorial plaque on the south west side of campus. Flags at the school have also been lowered to half-mast and will remain there until dusk. A second gathering at the Mount Royal chalet began at 5 p.m. At that ceremony 14 beams of light were projected into the night sky. The beams were turned on one by one as the names of the victims were read. The lights will stay on until 10 p.m.
Prime Minister Justin Trudeau issued a statement Tuesday, saying the victims were killed "simply because they were women." "Men and boys are a vital part of the solution to change attitudes and behaviours that allow for this violence to exist. There must be zero tolerance for violence against women, and only with everyone's support can we build a Canada that is safe for all," he said. Trudeau said all Canadians should use this day, which is also the National Day of Remembrance and Action on Violence Against Women, to "reflect on what Canadians — women, men, and youth — can do to rid the country and the planet of the scourges of misogyny and gender-based violence."